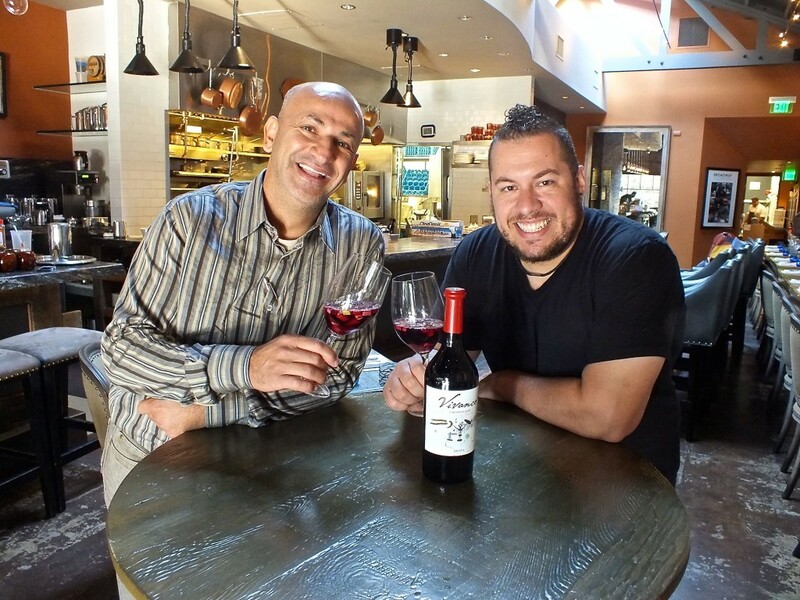 Chef Amar Santana and his business partner, Ahmed Labatte of Laguna Beach’s Broadway by Amar Santana, both recently returned from a six-week trip to Spain and Morocco. The trip was taken to prepare them for the opening in Fall 2015 of their newest restaurant, the Spanish-themed Vaca in Costa Mesa. However, the immediate result of the trip is a new Small Plates Menu on Tuesdays, where Chef Amar is providing guests with his interpretation of traditional Spanish tapas. I recently sat down with them to try some of the new dishes, discuss their trip and find out how it has influenced them and what is in store for both guests at their current restaurant, Broadway by Amar Santana and their upcoming Spanish restaurant, Vaca. “The main reason we went to Spain was that we’re opening a Spanish restaurant (Vaca) so I wanted to go there and experience the real deal”, Chef Santana said. “There are so many different variations of the classics, but something as simple as Pan con Tomate, we went to a lot of places and everybody is doing something different with it. I was able to plan and see what kind of version I wanted to do when I got back”. The Pan con Tomate is a basic dish consisting of toasted bread, drizzled with olive oil and tomato pulp. The new Tuesday Small Plates Menu is going to be a regular thing with the Spanish style tapas tastings at Broadway. Chef Amar said, “we’ll be doing it until we open Vaca, every Tuesday we’ll be trying out new dishes, trying out recipes for when we open Vaca, Most of the dishes are going to be served every week on the tasting menu. We might change a few things though. Some things might be changed if fresh ingredients are not available”. 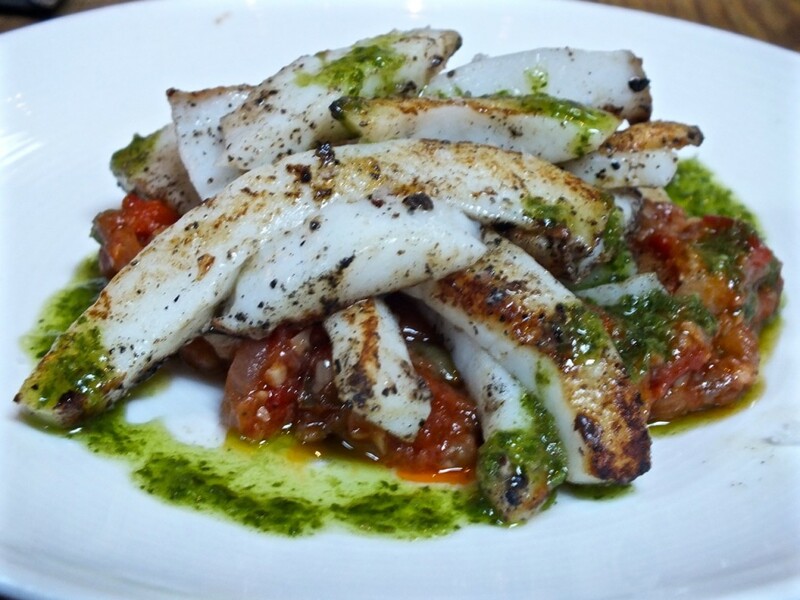 One dish that is on the Tuesday menu is Calamares a la Plancha con Samfaima y Salsa Verde (Calamari a la Plancha with stewed eggplant relish and green salsa). 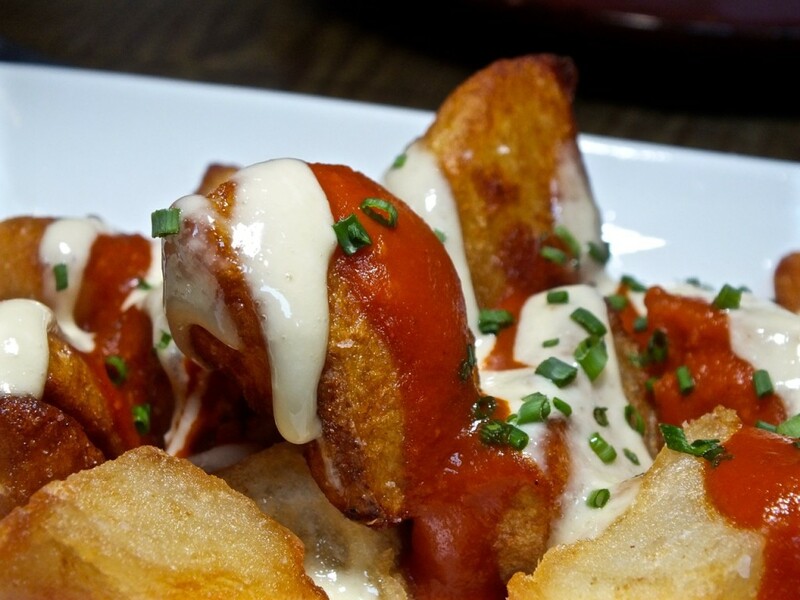 Chef Santana originally tried the dish in Spain and said, “We tried that dish in Barcelona. Actually, that was on our last day, I went out in the middle of no where, found this little tiny bar with a lot of people, sitting outside and drinking beers and wine. I didn’t even know if they had food, but we found two open seats and sat down and started ordering some food. It was amazing!”.The dish itself was truly wonderful, with possibly the most tender calamare I’ve ever had. Seafood of course is a popular item in Spain. One of the traditional items found in both Spain and its neighbor Portugal is bacalao, a piece of cod that is salted and dried for storage. When it is ready to be used, is is washed, drained and re-constituted for use. 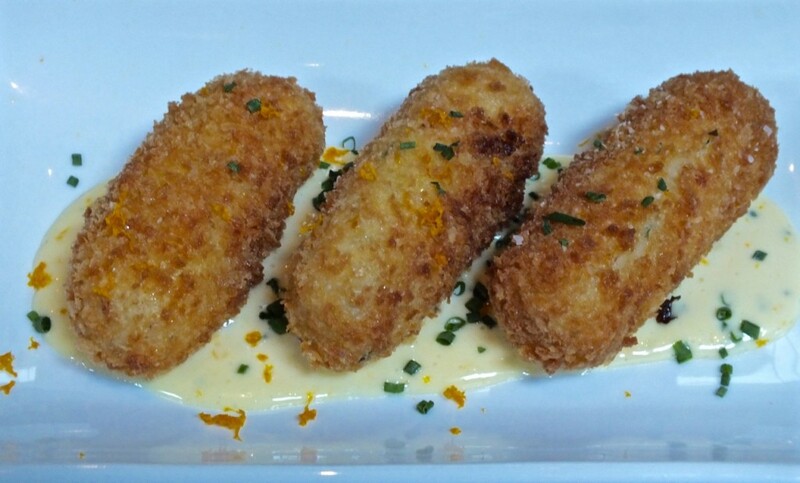 Chef Santana has put a dish of Croquetas de Bacalao on the menu. These fritters were absolutely delicious and surprisingly not salty at all. Chef Santana said, “I tried many different versions of it. I like the flavor of the ones I did tonight. The sauce for it is reduced orange juice, orange zest, mayonnaise and garlic”. It was indeed a very tasty sauce, well-balanced and very fresh tasting. This dish opened my eyes to bacalao, whose praises have been sung by many famous chefs. Another famous dish from Spain is paella, a rice dish made with various combinations of items including fresh seafood, Spanish chorizo and chicken. “One of the things I went to Spain for and wanted to see and experience was the paella”, Chef Amar said. “To be honest, we had some good paellas and some not so good paellas over there. It allowed me to come back here and make my own version of paella and from what people have said so far they really like my version of paella. Some people who have been to Spain have said that outside of Spain, it’s the best paella they have ever had. That made me very, very happy!”. Ahmed Labatte, one of Chef Amar’s business partners along with Rich Cadarette, is the Director of Operations of Broadway by Amar Santana. Ahmed accompanied Chef Amar on the trip to both Spain and also a visit to Morocco, his native country. Ahmed came away with some lasting impressions of Spain, saying, “My first impression was the flavors. The freshness and the taste of the seafood. That was my biggest impression. I wasn’t expecting it, because I’m also from Morocco and we have that flavor of the fresh seafood, but the variety of the seafood…..that was mind-boggling to me. The availability of all kinds of seafood, shellfish, fish, all kinds of stuff. That was the biggest thing, the variety”. The visit to Spain really inspired Ahmed towards the opening of Vaca. He said, “Amar and I were like kids in a candy store. We were going out to these tapas places and restaurants and we kept saying, ‘Oh! This will work! Oh! This will work! Amar can you do this?’. We were on a hunt for some good eats and it’s also that we wanted to see—-you can’t open a Spanish restaurant without ever having been to Spain, so the whole trip was based on needing to go see what the cuisine was all about and how they do it and what’s the culture there. That was the main purpose of the trip. Not really to show Amar how to make dishes—he knows how to make dishes. It was just the fact of seeing which was the best of the traditional dishes. Also, how he could make a certain thing similar, but yet appealing to the American palate”. The visit to Morocco was also special for Ahmed. 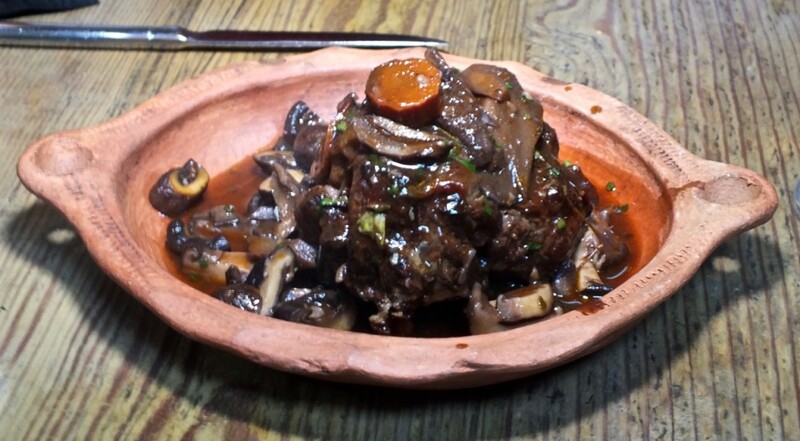 He spoke about whether their would be any Moroccan dishes of the Broadway by Amar Santana menu, saying, “Absolutely! Amar changed the menu last Thursday and he put a saffron couscous with harissa vegetables on it. That’s going to be very interesting. I tasted the harissa and he said, ‘I know it’s not the same as we had in Morocco, but I think it’s a pretty close and pretty good harissa’. He made a very good one though. He had a lot of fun in Morocco as well, he was exposed to another type of culture as well as another type of cuisine, so it was very interesting”. For lovers of spicy dishes this is a great one to try. Harissa is a Moroccan condiment, a spicy and aromatic chili paste from Morocco. Overall, both Chef Amar and Ahmed had a good trip. Ahmed summed it up by saying, “We had a tremendous trip. There is so much flavor, so much culture in both countries that it will translate into the food that we are preparing at Broadway and also into the food for the next restaurant, Vaca. Amar calls the menu for Tuesdays at Broadway small plates, while I call it small bites with big flavor. Every Tuesday we’ll be doing something different. We’ll try new things before Vaca opens and we’ll have much more variety in Vaca”. Broadway by Amar Santana is located in Laguna Beach at 328 Glennayre Street, Laguna Beach 92651. The phone number for information and reservations is (949) 715-8234. Broadway’s website is www.broadwaybyamarsantana.com. The new Small Plates Menu is available every Tuesday in addition to the regular menu.